I believe that dying takes many forms. Beyond death of the mortal body, it can be the death of a dream, the expiration of hope that a career, a relationship, or physical health will proceed as expected. Death can come in the form of someone receiving a diagnosis of a serious illness or suddenly losing her job. Death can be more than physical. It can come in the form of an emotional, relationship, or financial crisis that changes everything. For former accountant and financial planner Lisa Fittipaldi death came in the form of sudden legal blindness at age 47. It's not hard to imagine the anger she felt at the prospect of living life in near darkness. It's not hard to imagine the bloated feeling of loss that rose in her belly every morning as she woke and sunk into her restless mind every night that she tossed and turned, trying to sleep but wide awake, fearful, and anxious. It is hard to imagine that Fittipaldi would one day call the crisis a blessing. 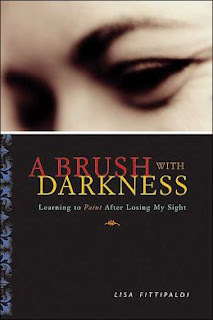 But she did, according to the publisher comments for her book A Brush with Darkness: Learning to Paint After Losing My Sight. "I truly feel that unless blindness had toppled the carefully maintained edifice I called my life," she said, "there is no way that I would be the kinder, more fulfilled person I am today." That insight took years though. Two years after Fittipaldi was declared legally blind something miraculous happened. Her husband gave her a watercolor paint set and told her to do something, and she did. According to the much told story, she produced a painting of three jars that surprised her and her husband. Fittipaldi had never been a painter, so she had to draw upon other talents, knowledge, and passions to help her with the painting process. She used her knowledge of calculus and her memories of trips to foreign lands to produce lively, colorful paintings that realistically portrayed diverse cultures. Fittipaldi's story perfectly illustrates the human tendency to avoid change until something or someone forces it upon us and the potential gift of finally accepting the change. I love to watch the MTV show MADE. Each episode features a young person who says he or she wants to be "made" into something very different from his or her current persona (such as, a shy boy that wants to become a lady's man or tomboy who wants to become prom queen). As a professional coach starts to work with the young person and set tough goals, the young person (with very few exceptions) starts to whine and rebel. "I can't do this," he or she usually says at some point. Then, after a come-to-Jesus talk from the coach the young person submits, and voila! He or she reaches the goal (usually to everyone's surprise). More than a decade after Fittipaldi's crisis she has become a well known artist and sold more than 500 paintings. She has founded a non-profit organization, and written many books. More than a decade later her crisis has morphed into a very unlikely miracle.